It snowed again last night. Arrgghh. No matter. It's March, and I am declaring winter to be over. At least inside my house. It doesn't take a lot to make a nice little holiday vignette. I'm still using my ugly-Goodwill-plate-turned-chalkboard, as well as my Heirloom-white-painted candlesticks. I just changed the Valentine's greeting to a St. Patrick's greeting and the red candles to green candles. The other things I've picked up over the years. Pull some green candles from your Christmas stash. Or pull some green wrapping paper from your Christmas stash, and either wrap a band of paper around the candles a la Amanda or Mod Podge some onto your candles a la Manuela or Traci. St. Patrick's Day is all about the wearing of the green. If nothing else, you probably have a green plant you can showcase. If not, buy a little golden pothos next time you're at the grocery store. These plants are practically foolproof, and their beautiful color will brighten any tabletop. 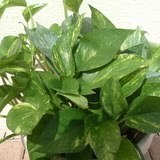 You can read all about golden pothos here. Next year, look for wrapped candies such as Hershey's kisses on after-Christmas clearance. Divide the candies into colors. Use silver-wrapped candies for New Year's, red-wrapped candies for Valentine's Day, and green-wrapped candies for St. Patrick's Day. Try to drop by TJMaxx or HomeGoods right after St. Patrick's Day. You'll likely be able to find some special little St. Patrick's goody on clearance. Now, just for fun: can you tell me what "Erin Go Bragh" means? Leave me a comment with the answer, and I'll randomly choose a winner for a little prize! That's cute. Even if you don't decorate the whole house, like for Christmas or Easter, it's fun to have a little area dedicated to a smaller holiday. and thanks for checking up on me :) i promise to continue my story soon. just rying to catch up on everything since being sick. or being sick. i think i still am. and i am ready to be better! my maiden name is conley, guess i should go find a wee little green for around the house. Love the pitcher so much!!! Being Irish... I would use that pitcher all year long!!! I love the little silver 4 leaf clover dish....my sis would love that! I need to go get my St. Patrick's Day garden flag out! Ireland Forever! Makes me miss my childhood friend -- her parents were from Ireland. I actually looked it up before I saw where you posed the question...I'm Irish/Welsh, and I'm ashamed to say I didn't know what it meant! Boo me! I have to admit that I usually focus on my Welsh heritage. My sister called Monday and the first thing she said was, "Happy Saint David's Day!" I said, "Huh?" She said, "He's the patron saint of Wales! Much lesser known than St. Patrick." We both cracked up. If you can believe it...I don't have ANY St. Patty's day decorations. I probably won't decorate. It's already the 3rd. But your decorations are really cute. It is the Anglicisation of a Gaelic phrase used to express allegiance to Ireland. It is most often translated as "Ireland Forever"
Ireland Forever! Very cute vignette! There's a special place in heaven. . .